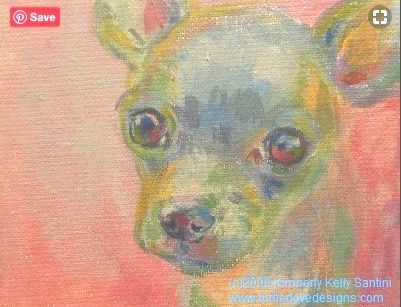 My very first Dog a Day painting, Pink, a little 4" x 5" panel, private collection (THANK YOU!). This is where things really began to take off. But let's go back in time a little first. I got a little press, a TON of support from collectors and friends, and suddenly there was a Painting a Dog a Day community. My daily newsletter went out to 1000+ readers, wait lists for a Dog a Day portrait stretched into months, and I completely revamped my studio operations to focus on small portraits, 3-4 each week, with the remaining daily slots left for whatever I felt like painting. Which, for the most part the first year or two, was primarily dogs. But my connection with canines started long before this, and in the next 30 days I will share some of those roots with you, along with some more recent stories, all connecting dogs and my artwork. Stay tuned, invite your friends (because word of mouth is the best sort of endorsement), and share your own stories. Welcome to 30 Dogs 30 Days.